← Now, THAT’S Digital Humanities! 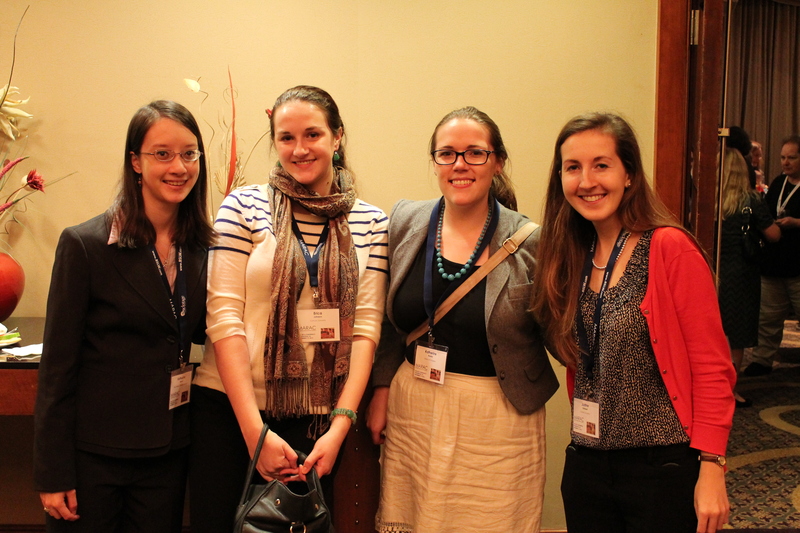 This past weekend, archivists descended upon the city of Philadelphia. With our notebook and pencil in hand, we were ready to watch, listen, and discuss art and advocacy in the wonderful world of archives. What is the reason for this gathering of archivists, you ask? Why it’s Mid-Atlantic Regional Archives Conference! During our weekend in Philadelphia, we learned how to determine the date of daguerreotype photographs and improve our elevator speech all in the same conference. Most importantly, we mixed and mingled with other Mid-Atlantic archivists and had a great time. Mid-Atlantic Regional Archives Conference in Philadelphia, PA.
Five of us from the CUA Dept. of Library and Information Science were in attendance: Katherine Stinson, Erica Johnson, Katie Rodda, Justine Rothbart (Me), and Prof. Jane Zhang. Since there were too many sessions to mention in one blog post, I am going to focus on one of the most, in my opinion, inspirational sessions of the entire conference. The session was titled: Politics, Professionalism, and the Future of Archival Advocacy. It was chaired by Ed Galloway (University of Pittsburgh), with a panel of speakers that included: Bradley Wiles (American Public University), Laura Starratt (Emory University), Jeremy Brett (University of Iowa), and Christine George (SUNY Buffalo Law School). The emotional impact is another major component to advocacy. “Photographs connect with people in a way other documents do not.” One speaker mentioned the importance of showing before and after photographs of the collection. What did it look like before you started your job? What does it look like now? Showing a tangible improvement is key to advocacy. Christine George talked about “Archives Bins.” In SUNY Buffalo Law Library, she puts “Archives Bins” in other offices for other staff members to contribute items into the archives. Once the bins are collected from each office, then the archivist appraises the items. This was just one of many educational, inspiring, and entertaining sessions of the conference. Spending my weekend with CUA LIS students and archivists was a great way to meet other archivists in the field and have a fun time! If you decide to attend the Mid-Atlantic Regional Archives Conference in the future (which I recommend you do), you’ll definitely see me there again! This entry was posted in Event and tagged Advocacy, Archives, Conference, CUA, MARAC, Mid-Atlantic Regional Archives Conference, Philadelphia, Philly. Bookmark the permalink.